Handford L. "Lynn" Cummings, 80, a retired Air Force Colonel and physics and mathematics teacher at Thomas Jefferson High School for Science and Technology in Alexandria, died of cancer January 4, 2004, at Walter Reed Army Medical Center. Colonel Cummings, who had lived in the Mount Vernon area of Alexandria since 1968, was born in East Orange, New Jersey. He was a 1945 graduate of the U.S. Military Academy at West Point and received a master's degree in aeronautical engineering from Massachusetts Institute of Technology. In his 30-year military career, his assignments included service as an instructor at Wright-Patterson Air Force Base in Ohio, research duties with the U.S. space program at Patrick Air Force Base in Florida and combat flying in Vietnam during the war there. He flew a Canberra jet bomber on 73 missions during the war. Colonel Cummings retired from active military duty in 1975. His final active-duty assignment was deputy inspector general of the Air Force Systems Command at Andrews Air Force Base. His decorations include two awards of the Legion of Merit, the Distinguished Flying Cross and the Bronze Star. After his retirement, he worked about 10 years in sales and marketing for Omni International Corp., a jet-airplane trading company in Rockville. He then taught at Thomas Jefferson High School for about five years until 1990. He worked as a substitute teacher in Fairfax and Prince William counties until the mid-1990s. 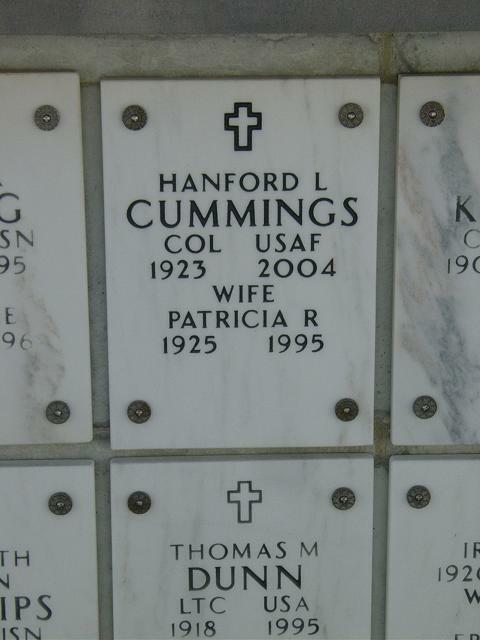 His first wife, Patricia Ryan Cummings, died in 1995. Survivors include his wife of eight years, Maxine Cummings of Alexandria; three sons from his first marriage, William Cummings of India, Steven Cummings of Portland, Ore., and Michael Cummings of Winston-Salem, N.C.; three stepchildren, Beth O'Malley of Littleton, Colo., Carol Haley of Atlanta and Robert Stout of Cincinnati; a sister; 12 grandchildren; and seven great-grandchildren. On Sunday, January 4, 2004, of Alexandria, VA. Loving husband of Maxine S. Cummings and the late Patricia Ryan Cummings; father of William, Steven and Michael Cummings. Also survived by five grandchildren and three great-grandchildren. He is also survived by Maxine's three children and their families, including seven grandchildren. Interment Arlington National Cemetery at a later date.